Investment in the latest technology has allowed for business expansion into neighbouring countries. Metal Frame Buildings SRL (MFB), previously known as Metallika Ktiria SA, is located in Bucharest, Romania and started production in 2009. This was not noticeable when working at their old site in Crete, Greece but owner, Mr Nikos Giannoulakis, made the executive decision of investing in technology in order to seek greater business opportunities, that technology being STRUMIS. STRUMIS is a fabrication management software solution which provides steel fabricators with the increase in productivity, reduction in material wastage, improvement in efficiencies and required traceability to facilitate improved competitiveness and ultimately become more profitable. Sitting on 50.000 m2 of land, MFB have grown in stature as a business since selecting STRUMIS as their preferred fabrication management information system. Nikos Giannoulakis comments "From early stages we have collaborated with AceCad through previous software - StruCad - and it was a logical step when we started MFB to have built our own design team for production and quality purposes. We rely on dedicated software for steel structures and STRUMIS is our driving force and the most efficient software for our purposes!” MFB fabrication process is fully automated, by using cutting-edge technology in machinery. STRUMIS allows businesses to work more effectively. This steel fabrication management software harnesses work processes through the steelwork contract between departments, suppliers and clients; from estimate tendering, through procurement and production into construction. STRUMIS offers workflow and automation advantages leading to greater efficiencies, material and processing savings for greater profitability with enhanced productivity, and organisational benefits through process control for both quality and traceability. This business growth and quality, coupled with quality assurance certification such as ISO and the soon to be mandatory CE Marking in EU states, assisted by the use of STRUMIS, has led to further expansion into neighbouring countries by successfully exporting work within Europe, such as Ukraine, Georgia, Belgium, Italy. 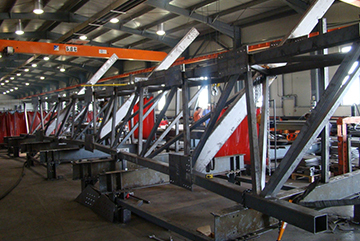 Fabrication management software solution provides steel fabricators with the increase in productivity, reduction in material wastage, improvement in efficiencies and required traceability to facilitate improved competitiveness and ultimately become more profitable. About Metal Frame Buildings SRL. MFB is the latest company from our group located in Bucharest Romania. 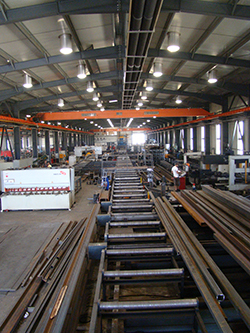 Our companies which are located in Crete Greece have a long history in the Metal sector since 1967. In Romania we own a 50.000 sqm site which we have a covered area for production purposes and an outside storage area for materials. Emphasizing on the quality, MFB is also certified according to the present quality management systems ISO 9001: 2008, the environmental ISO 14001:2004, Health and safety OSHAS18001:2007 the CE marking (SR) EN 1090-1:2009+A1:2011 and also for welding procedures EN-ISO 15614-1 and qualified welders EN 287-1.